AFTER TEN YEARS A Tribute To Stanley G. Weinbaum This 30-page, mimeographed booklet has been published by Gerry de la Ree and Sam Moskowitz in memory of one of Science Fiction's greatest authors, Stanley G. Weinbaum, who died on December 14, 1935 Out of an original edition of 125, only 35 copies now remain. 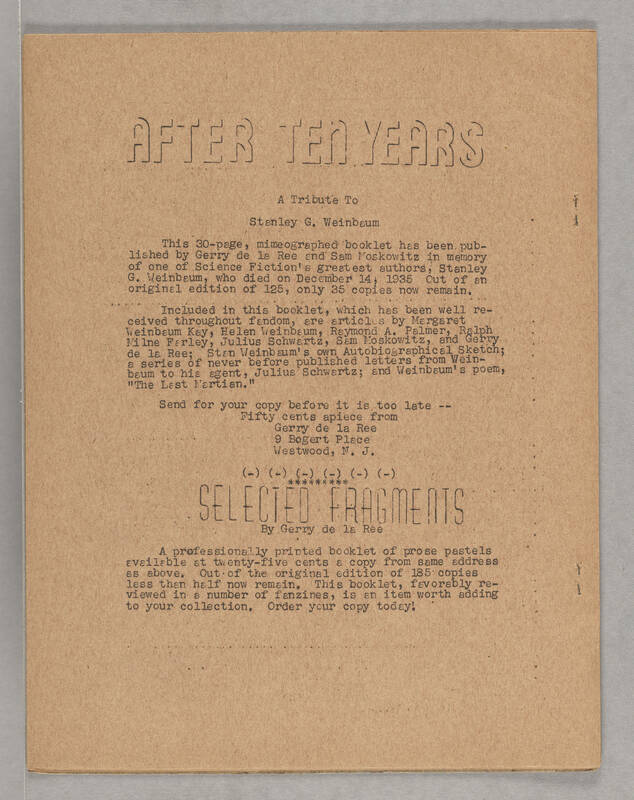 Included in this booklet, which has been well received throughout fandom, are articles by Margaret Weinbaum Kay, Helen Weinbaum, Raymond A. Palmer, Ralph Milne Farley, Julius Schwartz, Sam Moskowitz, and Gerry de la Ree; Stan Weinbaum's own Autobiographical Sketch; a series of never before published letters from Weinbaum to his agent, Julius Schwartz; and Weinbaum's poem, "The Last Martian." Send for your copy before it is too late -- Fifty cents apiece from Gerry de la Ree 9 Bogert Place Westwood, N.J. (-) (-) . (-) . (-) . (-) . (-) ********* SELECTED FRAGMENTS By Gerry de la Ree A professionally printed booklet of prose pastels available at twenty-five cents a copy from same address as above. Out of the original edition of 185 copies less than half now remain. This booklet, favorably reviewed in a number of fanzines, is an item worth adding to your collection. Order your copy today!